We’ve just learned a lot about shift registers. Now, let’s apply that knowledge to control a 7-segment Display so we can display numbers (and a few letters) in the physical world. We’ll connect the 7-segment display to the shift register that we wired up last time. We’ll write a program to send serial signals to the shift register which will be transformed into numbers and letters on the 7-segment display. We’ll then observe the output and see if there’s anything interesting we notice. Note: This experiment builds on the previous one, so you should make sure you complete it before moving on! If you’re wondering why it’s called a 7-segment display, wonder no more! 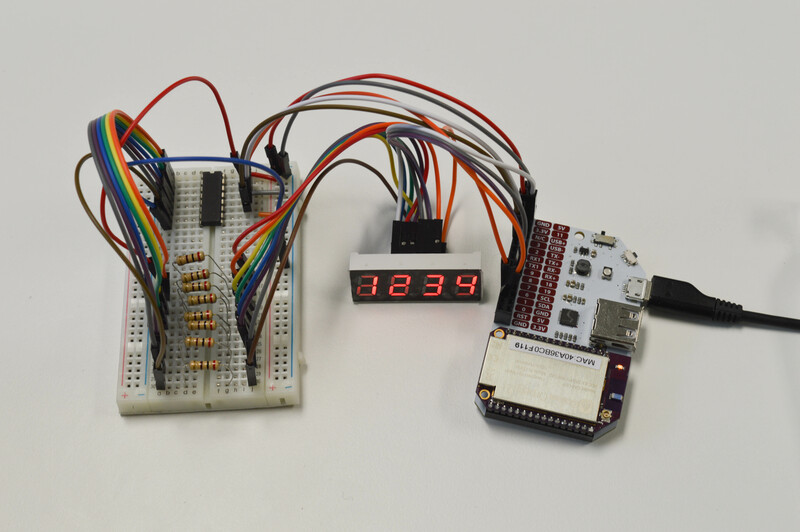 7-segment displays with more than one digit usually have each segment connected in parallel across all of the digits; this is to save pins on the display module itself. For example, if you try to light up the segments will display a “1”, it will appear on all of the digits at the same time! This isn’t really useful, so each digit has its own scan pin that groups segments for each digit together. This pin then controls whether the digit’s LEDs can be turned on or not. 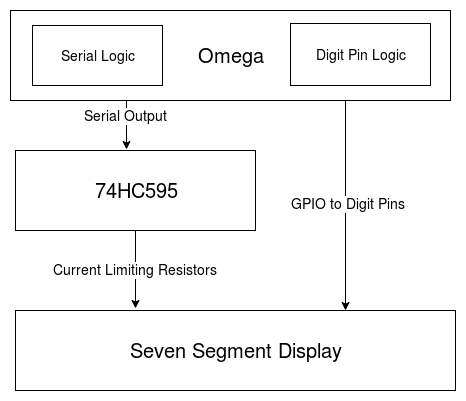 To control the segments on a single-digit 7-seg display, you need at least seven GPIOs. And in order to control multiple digits at once, we need one additional GPIO for each scan pin. 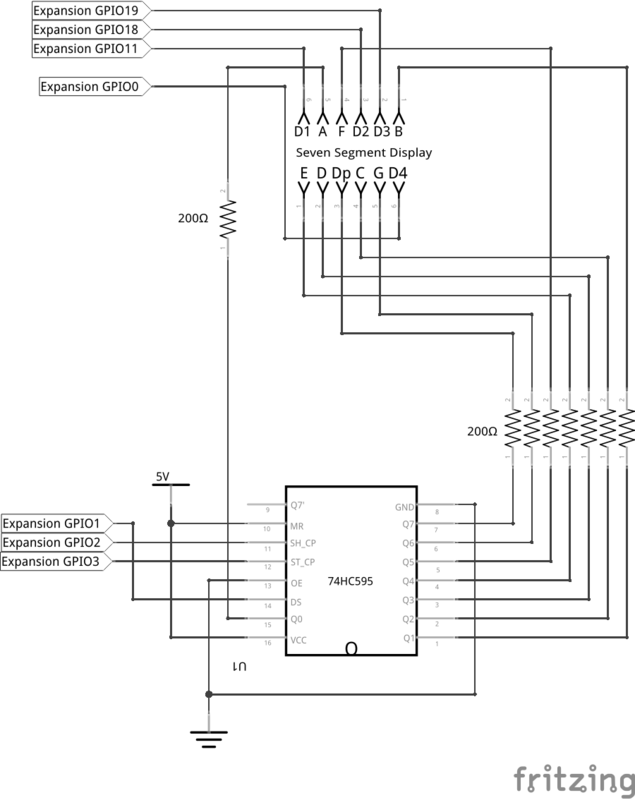 This can really add up, so we can use a shift register to increase the number of output pins available to us. This is usually how 7-segs are incorporated into a project in order to minimize the number of pins used on the controller. 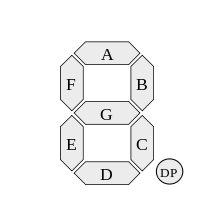 7-segment displays are sometimes called “7-segs” for short. The 7-segment display has an LED for each of the seven segments and an LED for the decimal point. That means there are 32 LEDs in total since there are four digits on the display. The Omega by itself doesn’t have enough GPIOs to control all those LEDs, but we can make up for this by using the shift register in combination with only a handful more GPIOs! First things first, we’ll be building on our previous experiment. If you’ve done the previous experiment, keep the shift register connected to the Omega just like you had it. However, you’ll need to remove the LEDs and resistors. If you skipped it, we strongly recommend you check it out before moving on to this one! It’s important that all components have a common ground connection. Signals are measured as the difference in voltage between the signal pin and ground, so all of the components need to be measuring from the same baseline. When you have the shift register wired up, it’s time to connect it to the 7-segment display. First, we’ll have to add current-limiting resistors since the display is a set of multiple LEDs. We recommend you set up the resistors across the center first, and do all the wiring in one go. We’ve included a diagram below for reference instead of instructions, as this one has a lot of wiring to do and they end up going every which way. Note that all ends connecting to the 7-segment display require F jumper heads - that’s where your M-F jumpers will be used. To accomplish this, we will write a new class that uses and builds upon the shift register class from the previous experiment. Now let’s create a class named sevenSegDisplay.py. "notHexNumber": "Input string is not a valid hex number. " The showDigit() function is called with a digit number i and digit character inputHexString[i] to be displayed. In this function, the scan pin for the current digit is enabled and is ready to light up. We then send to the shift register the binary values corresponding to the segments for the current digit. We then cycle through all of the digits and repeat the steps above for each one. This numbering system is known as hexadecimal or base 16, where each digit can have a value from 0 - 15; the numbers 10 to 15 are represented by the letters A to F respectively. This is different from our everyday decimal (base 10) system where each digit can have a value from 0-9. Hexadecimal (“hex” for short) is very useful in expressing binary numbers with few digits. For example, the eight-digit binary number 0b11000000 (192 in decimal) can be expressed in two digits in hex as 0xC0! This unexports the GPIOs, making them available for use by other programs. 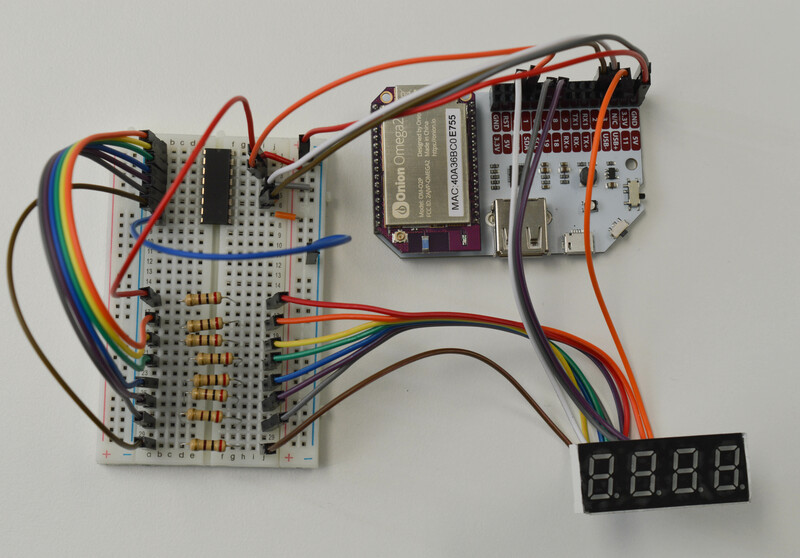 If run correctly, the code above should print the digits one by one on the 7-segment display. 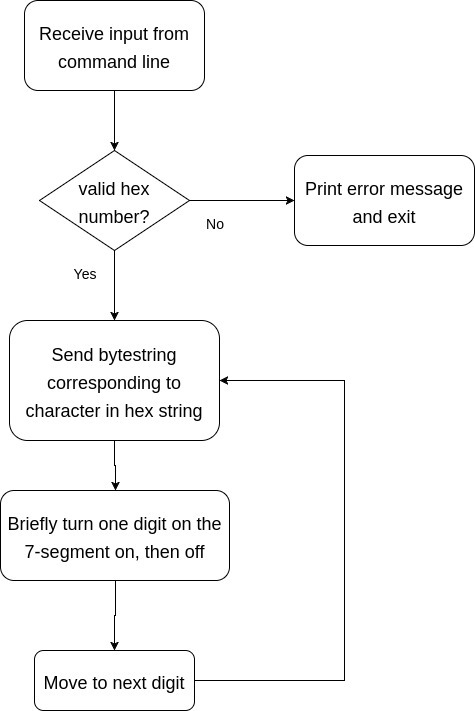 If the hex number was not entered in correctly, it will print an error message and exit. The code runs in an infinite loop which you can exit with Ctrl-C (Cmd-C for Mac users). Wow, what’s up with that? You may be wondering if this is normal - the answer is yes. The digits on the 7-seg will be turning on and off in order slowly enough for you to notice. However, you probably guessed that it really should be displaying them all at once. This code couldn’t exactly do what we needed it to, but there are still some important concepts shown here. To display numbers on the 7-seg, we mapped the characters to binary bytestrings using a dictionary. We also included a class within another class to better abstract the operation of the physical components. However, the end result was limited by the software we used: we wanted and expected the 7-segment display to light up all at once, but our script couldn’t make it happen fast enough. This is because the underlying onionGpio class is written so that it accesses the filesystem multiple times for each GPIO write, and the Omega cannot run these commands fast enough. In this experiment, the software and hardware interact to produce behaviour we didn’t intend. The code runs as well as it possibly can, and the hardware does its best to operate from the signals its given, but ultimately the result is not workable. The root cause is the way the onionGpio library is programmed. The onionGpio module does this in a very safe and consistent way via our C library. However, this also means that it’s quite slow and not fast enough for our display. Code reusability: Earlier we wrote an independent class for the shift register, but now we’re using it like a Lego block to build something new. This lets us focus on new code for the 7-seg. We can do this for any other device that requires a shift register without writing another copy of the class. Abstraction: The ShiftRegister class gives us full control over a shift register device. However, when we’re working with a 7-seg, we don’t really care about the shift register anymore. At most, we should only have to tell the ShiftRegister object which GPIOs to use and it would take care of the rest; we can then work on translating text input into which LED segments to light up. These ideas makes it easier to think about how different pieces of a project work together. This helps us focus on designing systems and logic rather than getting bogged down in the details. So far we’ve been working with lists, which are collections of one or more data values in order. The values in lists are indexed by numbers, for example students. However, there are times when we’re more interested in working with these values by using meaningful names than working with them in order. Enter the dictionary! Dictionaries are data structures that contain key-value pairs. A key is a name or label, and the value is some data that you want to associate with that key; it could even be another dictionary! Dictionaries are indexed by their keys, for example students["Robert Tables"]. Instead of creating individual variables for each and every character, we can use the dictionary to act as a translator between characters and the values that need to be written to the shift register. if we wanted to display the character 1, we send the required bytestring to the shift register by calling digitMap["1"] instead of typing 00000110; the same goes for any other character. In Python, dictionary keys can be strings, integers, or tuples. In the digitMap dictionary, we use strings to make it easy to work with other functions that send strings, for example from command line arguments in our main script. Dictionaries work similarly in programming as they do in real life: You can find a definition (value) by looking up a name or title (key). Dictionaries are also mutable, meaning that you can add new key-value pairs, or modify existing ones! Our Python implementation couldn’t perform as fast as we needed it due to how the onionGpio library performs multiple file writes when working with the GPIOs. However, we have another tool up our sleeve: ash! ash, or the Almquist Shell, is a lightweight Unix shell. One of its variants, BusyBox ash, is included in the Omega’s firmware and can be run by calling sh. This tool is used for running shell scripts, which are collections of terminal commands structured like a program. We’ve changed how we’re going to be accessing and controlling the GPIOs by working with the filesystem directly. If you’d like to see how that looks, we’ve provided a shell script below that does this properly. pref1="$(echo $input | sed -e 's/^\(.\). */\1/')"
pref2="$(echo $input | sed -e 's/^.\(.\). */\1/')"
chr1="$(echo $input | sed -e 's/^..\(.\). */\1/')"
chr2="$(echo $input | sed -e 's/^...\(.\). */\1/')"
chr3="$(echo $input | sed -e 's/^....\(.\). */\1/')"
chr4="$(echo $input | sed -e 's/^.....\(.\). */\1/')"
echo "Please input a hex number in the following format: 0x12ab"
echo "1 1 1 1 1 1 0 0"
echo "0 1 1 0 0 0 0 0"
echo "1 1 0 1 1 0 1 0"
echo "1 1 1 1 0 0 1 0"
echo "0 1 1 0 0 1 1 0"
echo "1 0 1 1 0 1 1 0"
echo "1 0 1 1 1 1 1 0"
echo "1 1 1 0 0 0 0 0"
echo "1 1 1 1 1 1 1 0"
echo "1 1 1 1 0 1 1 0"
echo "1 1 1 0 1 1 1 0"
echo "0 0 1 1 1 1 1 0"
echo "1 0 0 1 1 1 0 0"
echo "0 1 1 1 1 0 1 0"
echo "1 0 0 1 1 1 1 0"
echo "1 0 0 0 1 1 1 0"
echo "Invalid hex digit $1." You should now see the characters display without flickering, much better than last time! This shell script looks a lot different from our Python code! The biggest difference is that there are no lists nor dictionaries in ash, and that we only export the GPIOs once. In our Python script, we were able to access each individual character of the input hex string by simply treating the string as a list and iterating over each character, as in inputHexString[i]. However, ash doesn’t support lists and so we have to load each character into its own variable, chr1 to chr4. This is done using the sed command; for a full reference of this powerful tool, check out this online tutorial. The same goes for our digit map. Since we can’t simply call digitMap[character], we wrote a function mapDigit() that takes a character as an argument and returns the corresponding bytestring if found. Since we know that the GPIOs are all supposed to be outputs only, we can export them only once at the beginning and not have to worry about freeing them up for other purposes later. The rest of the script is similar to the Python implementation where we repeatedly change the scan pin and send different values to the shift register. This is faster because we only now have to access the filesystem once to set the GPIOs each time! Writing this type of code requires a deeper understanding of how the hardware and software interact. If you’re curious, you can take a look at some examples in our Developing Using the Command Line Guide.